Few things can make a foodie as happy as a portion of homemade fishcakes and frites courtesy of this granddaddy of the Leith eating scene. 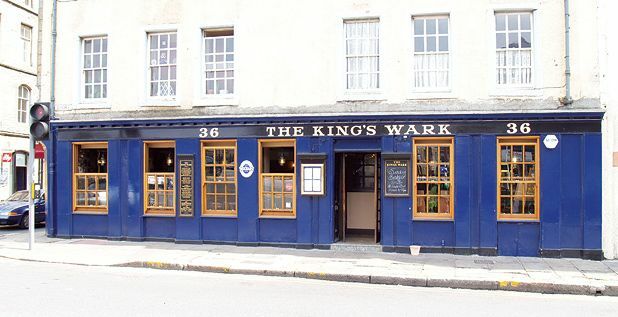 Oozing olde worlde charm, the Wark's menu boasts everything from rich seafood chowder to solid basics like a steak sandwich. Busy from lunch pretty much through to dinnertime, the Wark manages that rare thing of balancing a laidback setting with top-notch grub. Pizza lovers brace yourself for what is arguably (in this Leither's opinion) the finest pizza in Edinburgh. Twin log-fired ovens produce only the lightest, crispiest of bases beneath a treasure trove of potential toppings, picked from a menu lovingly split into sections, including seafood, vegetarian, carne and gluten free. Add to the mix some frisky young waiters and there's little room for complaint. Rocketing onto the scene in 2013, The Vintage almost immediately spawned copycat dishes across other menus when it became obvious how well their charcuterie and seafood grazing platters were going down. The à la carte is just as good, and, with backing from Alloa brewery Williams Bros, the beer board is among the best in town. This – alongside Joseph Pearce's at the top of the Walk, Boda a block down, and Sofi's on the Shore – is owned by the Boda Bar Group, and any Leither will happily tell you that each bar brings its own special brand of charm to the party. Each boasts similar hallmarks from the greens and reds of their cosy seating to the intimate candles and boho chic decor. The Tailend Fish Restaurant & Fish Bar, 14 Albert Street, 0131 555 3577. At this celebration of the fish supper, foodies are invited to sit down or take away from a menu that boasts everything from swordfish to haddock and calamari to prawns. Co-owned by the one-time proprietor of the Anstruther Fish Bar, this tasty venture is decked out with soft green panelling, photography and wooden chairs, only adding to its old-school tearoom feel. Friendly Leith Walk spot for eating in, takeaway and delivery, offering some of Edinburgh's best pizza. Cheerful neighbourhood pub with weekly language cafés, a popular singles speed dating event and an excellent section of vegan wines.